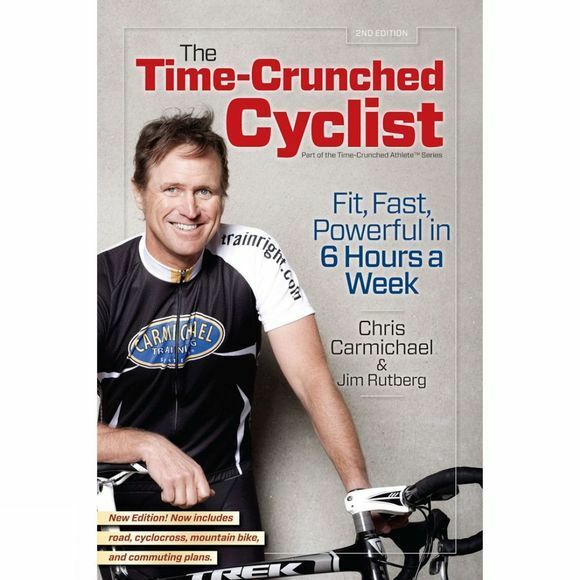 In The Time-Crunched Cyclist: Fit, Fast, and Powerful in 6 Hours a Week, Lance Armstrong's personal coach Chris Carmichael presents a revolutionary new approach to cycling training. The Time-Crunched Cyclist reveals the fastest way to get faster so that busy cyclists can build competitive cycling fitness on a realistic schedule. Complete with training plans, case studies, nutritional guidelines, and success stories, The Time-Crunched Cyclist is the book busy working professionals have been waiting for. Its proven concepts and training programmes enable cyclists to push the pace in the local group ride, have fun and perform well in local races, or tackle a challenging 100-mile fundraiser ride without committing to a high-volume training programme. Carmichael's popular time-crunched training programme shows cyclists how to build fitness fast by tapping the power of high-intensity interval workouts. Through 8 proven training plans, beginning and experienced cyclists will take a low-mileage route to new speed. Each plan includes effective time-crunched workouts, nutrition guidelines, and supplemental strength training. The Time-Crunched Cyclist will help former racers, bicycle commuters, 'cross fans, and mountain bikers capture their best performance-all in the time they have right now. This edition includes plans for road, cyclocross, mountain bike events, and multi-day tours – and even shows how to turn your daily bicycle commute into a time-crunched workout. Chris Carmichael was as an Olympian and a professional cyclist before becoming a renowned coach, best-selling author, and entrepreneur. He has coached 7-time Tour de France Champion Lance Armstrong since 1990. He served as the Men's Road Coach for the U.S. Olympic Cycling Team during the 1992 Olympic Games, and was the Head Coach for the U.S. Cycling Team for the 1996 Olympic Games.